The first time I heard the music, I thought Nina Simone was a man of course, with that deep amazing voice but also something in the phrasing. That ambiguity made me listen to her singing even harder. Most women didn’t sound like that (they still don’t sound like that – okay, Macy Gray sort of sounds like that but who is Macy Gray?) and the songs she sang were so unclassifiable: of her time, but way outside of time; somewhere else. Somewhere very high that I could feel but could barely reach. 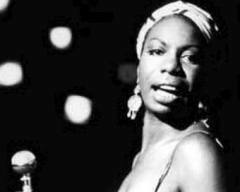 In the ‘70’s, I had the amazing accident of meeting Nina Simone after a concert she played in the US to make money to settle her famous debt of back taxes. She was standing in the vestibule of the Village Gate, smoking a cigarette, drinking a glass of wine. It was very dark and rainy outside and the only light that filled the space we were standing in came off the reflections of rain and windshields of the traffic passing by the front of the club. Simone’s album Baltimore had just come out and I asked her how she felt about Randy Newman, who’d written the title track. She told me how gifted she thought he was and how strange it was more singers weren’t doing their own versions of his songs. “He’s not commercial,” I said, which I felt, as soon as I said it something I certainly didn’t have to tell Nina Simone who was patently uncommercial before there was even another word to differentiate one from the other. Then she asked me if the Brasserie Restaurant was still open 24 hours and I said, to my knowledge, it was – open and bad food. She laughed. She asked me if I wanted to go with her but I was too shy and I said no. But mostly, I knew that if I went, I would have broken the spell that was only about a chance encounter in a vestibule in the rainy light after a concert. She gave me her empty wine glass and got into the shiny black limousine that had been waiting the whole time we were together and drove away. It was the first real intimacy I ever had with an artist and the new feeling of being in the presence of greatness washed over me like a storm. It’s wrong what choirs preach, some people are different than other people. Of all the goofy advisories in popular music none may be more true than the greatest thing that you could ever learn is just to love and be loved in return – the epiphany in the song “Nature Boy”, a recording of which exists by the genius jazz singer Kurt Elling. I love Kurt Elling. 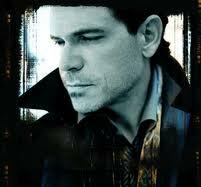 Kurt Elling is the new jazz singer that I love. I heard him on some college radio station and have wondered – the way I always wonder at something I love immediately – where was I when that happened? Kurt Elling will never love me in return, I know that. We will never meet and I will never break my fan’s anonymity again, ever since I broke it once only to meet a mean and soul-crushing dismissal by Keith Jarrett in the kitchen of the Village Gate when I was 20 years old when I asked him if he taught piano and he said … it doesn’t matter what he said … I don’t approach jazz musicians. I just approach their music. And besides, I don’t love Kurt Elling in the romantic way. I don’t even have a crush on Kurt Elling. My love for Kurt Elling is the love that lasts: I love what he talks about when he sings. Kurt Elling likes harmonies that emphasize the notes that are in the shadow – notes you might hear in back of the ones that are actually in the song. On one of his recordings Kurt Elling reads poetry while the jazz is playing in back of him – like the beats used to do in the ‘50’s. Those were the days – jazz and poetry taking off their clothes in front of each other. We’re so guarded about art now. I read an article once in the newspaper about how the downward economy has affected artists, which I thought was such a strange thing to say. It’s like wondering how the downward economy has affected poor people. Poorly, I imagine. Poorer. It said artists, because they have no money (as opposed to a time when they did have money?) can now do things they really want to do. Art, I imagine. Artier. Kurt Elling says: “There are times when fans will stop me after a show and say things like, “I’m so glad to hear a Christian Jazz musician who is able to speak up for God, “ or, “Thank you for being such a strong Christian.” Then I have to stop them and say, “I’m sorry, but while I am a Christian in many ways and refer to that tradition, I am also not a Christian; just as I am both a Jew and not a Jew – a Muslim and not a Muslim.” Then they’ll ask, “What does that mean?” And I answer, “It means I am an artist”. You are currently browsing the Singers category at Some Portraits and Notes on What I Heard.